The Hourly Pivots indicator displays pivots for any selectable period of N minutes. All pivots are calculated from the high, low and close of the prior N-minute period. The pivots can be displayed as floor pivots, wide pivots or Fibonacci pivots. 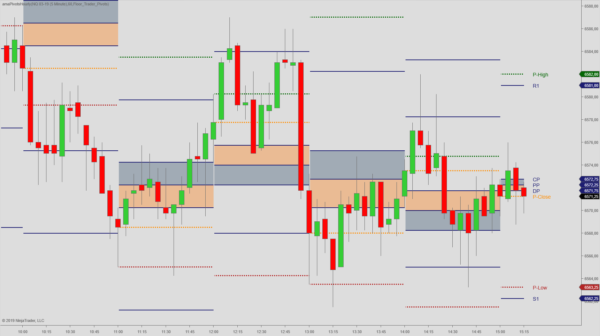 The indicator further plots the pivot range, which is a value area derived from the prior N-minute period. The default setting of the Hourly Pivots indicator is 60 minutes. With default settings the indicator will display hourly pivots including the Main Pivot PP, Central Pivot CP, Directional Pivot DP, Pivot Range, R1, R2, R3, R4 S1, S2, S3 and S4. The first period always starts with the daily session break. Depending on the period selected, the last pivot levels of the session may be calculated from a period of less than 60 min. Specifically, the shortened calculation will not carry over to the first period of the next session. As with our standard pivot indicators, the hourly pivots can be displayed as floor pivots, wide pivots or Fibonacci pivots. The indicator also plots the pivot range, which is a value area derived from the prior N-minute period.